Ok, I will stop there. I go cookie crazy!! I can’t control myself. 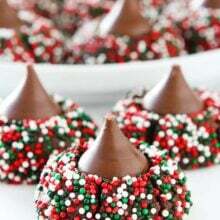 My new favorite holiday cookie are these Chocolate Kiss Cookies! 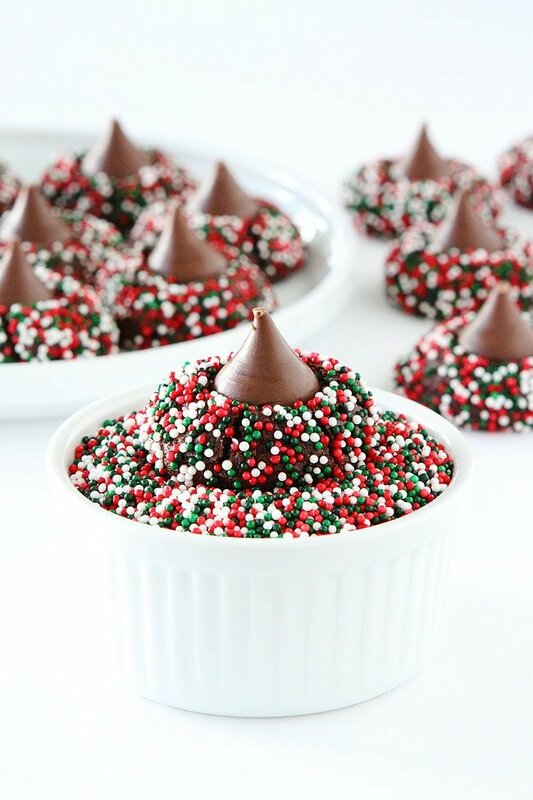 They are fun to make and the festive holiday sprinkles make them a holiday hit! 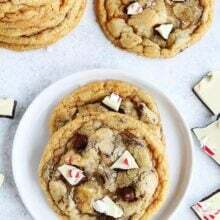 This cookie recipe is from Sally’s new cookbook, Sally’s Cookie Addiction, which is filled with amazing cookies. When I saw these cookies, I knew they would be the perfect Christmas cookie and I was right! 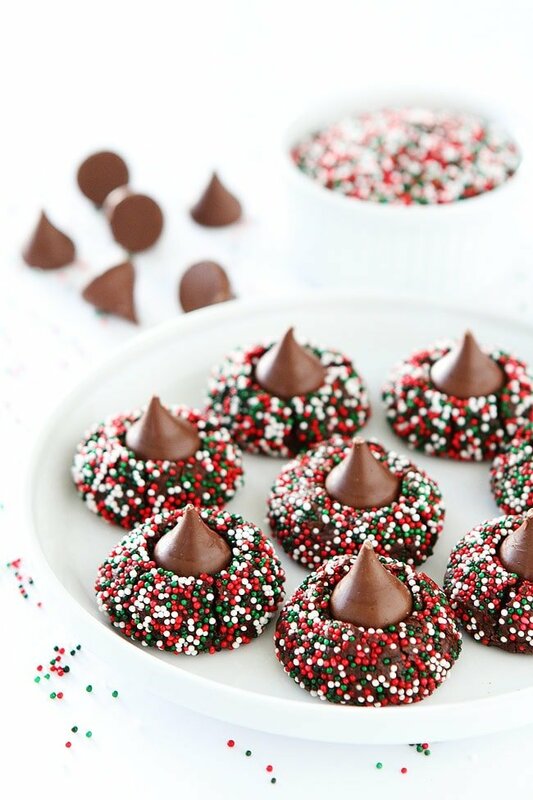 They are sure to be the star of every holiday cookie platter! 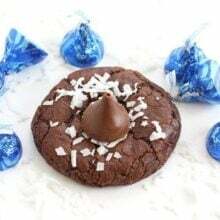 The cookies are very decadent, thanks to the rich chocolate cookie base and the chocolate kiss on top. Make sure you have a glass of cold milk nearby…and make sure you leave a glass for Santa too. I have a feeling Santa will LOVE these cookies. 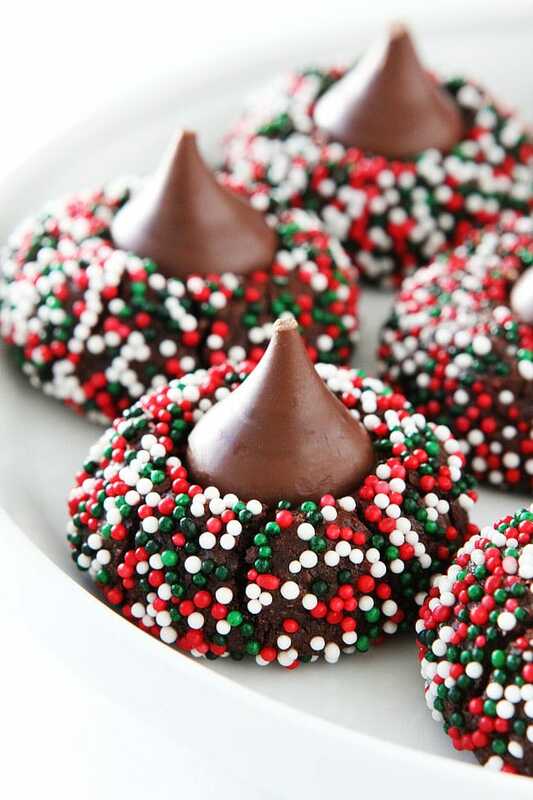 And these chocolate kiss cookies aren’t just for Christmas. You can make them year round by changing up the sprinkles. You can use red, white, and pink sprinkles for Valentine’s Day, green sprinkles for St. Patrick’s Day, pastel sprinkles for Easter, or rainbow sprinkles for birthdays! You could also use different flavored kisses in the center. Candy cane, mint, Hugs, almond…use your favorite! These fun cookies are perfect for any occasion! Make sure you bake these cookies this holiday season, they are guaranteed to make everyone happy! And check out Sally’s Cookie Addiction. The book is filled with amazing cookie recipes! 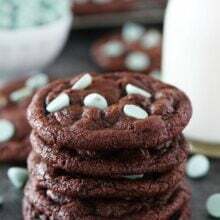 Chocolate Kiss Cookies-decadent chocolate cookies rolled in sprinkles and topped with a chocolate kiss. A fun cookie for the holidays or any day! Pour the sprinkles into a small bowl. Roll the balls of dough, about 3 teaspoons of dough per cookie, then roll each ball into the sprinkles to coat. Place the dough balls on the prepared baking sheet, 2 inches apart. Note-cookies will keep in an airtight container at room temperature for up to 1 week. The sprinkles make these so fun! These look SO CUTE and festive!!!!! I want to try this recipe but I’m wondering if the ingredients are correct. Is it really only one cup of flour? Doesn’t seem like enough? Yes, 1 cup of flour is correct. Could you make the dough ahead of time and store in the freezer? Would you also roll in sprinkles, then freeze? This recipe is a keeper. It is easy to mix together, the dough is easy to work with. You can get creative with the sprinkles to match the occasion. I will be making these again. 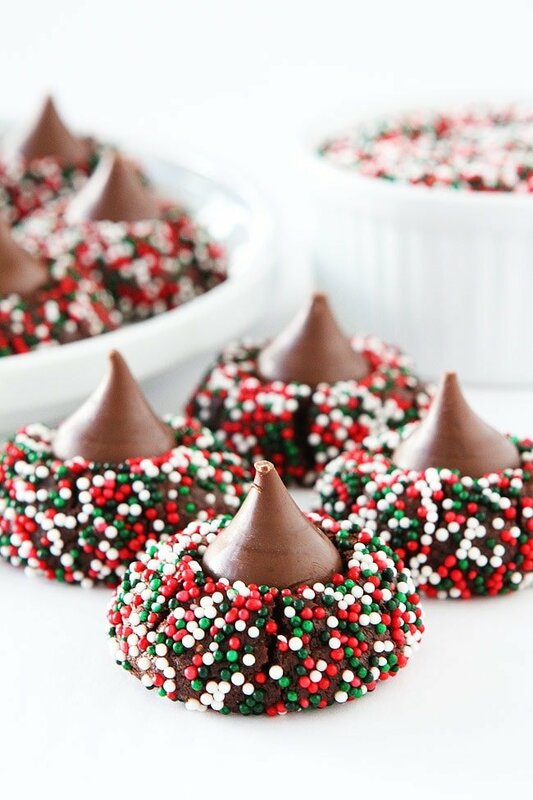 These were such a hit at a holiday party we went to! Thanks for sharing this recipe on Instagram and putting it on my radar. It’s such a festive holiday treat! These were delicious and my family loved them! Thank you! Such a great recipe! Thanks for sharing. Helllo. Dough spread to much even after cooling in refridge Dough was tasty. But I won’t use this one again. Mine didn’t spread very much, maybe your butter was too warm? I didn’t chill the dough. Was your butter too soft? You can chill if they are too flat, but mine weren’t flat at all. I tried it again, they turned out perfect! Maybe the butter was too soft the first time. They are so festive, thank you! I used the exact same sprinkles and the white and green colored ones evaporated into a clear color shell so after baking, I just see red sprinkles and the crunchy shell of the other two colors :'( Whyyy? Weird, maybe it was the brand of sprinkles you used? Taste like brownies, so rich.. so colorful. These were so good and I couldn’t believe they came out as beautiful as shown in your photos! sounds good to me, just make sure the thumbprint is deep enough so it doesn’t spill over. I made three batches of these for a work function and they all turned out perfectly- they are so moist and delicious! I’m not a baker usually and the recipe was so easy to follow. Thank you for the wonderful recipe! You are welcome! Glad they were a hit! They look great!will be trying out. Do you have a non chocolate recipe… is it a matter of omitting the coco powder? I would like to make a non chocolate version too. They are so pretty. We are wondering the same thing! No baking powder or baking Soda?? Do u have to flatten e copies or just roll them into balls then sprinkles then bake? I found waiting to put on the kiss split the cookies. I put the. On pretty much once I got the cookies out of the oven and then let them cool a bit longer before transferring to the cookie rack. Great recipe. I would make these without sprinkles. I love the look bit not crazy about eating them. Do you have suggestions? I’m thinking just rolling them in sugar. A pretty finishing sugar would be nice! To double the recipe, should i just double everything? THanks! I loved them. They were easy to make and look so festive. These sound delicious and easy! Can I prepare ahead of time and freeze them? These are sooooo good!!!! Just made them and they are an awesome sub for folks that don’t like or can’t have peanut butter kiss cookies. Followed the recipe exactly. You won’t be sorry if you try these. I just made these and they are very festive. Mine didn’t flatten at all when baked. When I waited 5 min then lightly pressed in a chocolate kiss into each one they split, so I had to be careful. When I used 3 tsp to form each ball, I only got 13 cookies not 25. I will make them smaller next time. I’m taking them to a party tonight so I haven’t tasted them yet, but the dough is very good! My grandson can’t have eggs. Do you know a substitute for the egg yolk? I made these last night, the only change being I used heavy cream instead of milk. They are perfect – very chocolatey and fun with the sprinkles! It didn’t seem like much dough but definitely made enough cookies. Make sure to use thy round ones – I ran out and used regular ones from the dollar store and they melted a bit. I made this tonight with my 5 year old son for his teachers’s Christmas treat bags. 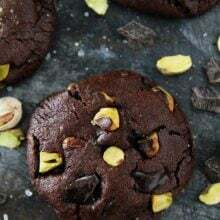 The recipe is super easy to follow abd the cookies came out smelling delicious and looking so festive (i have not tasted one yet). The only thing is I got only 15 cookies not 25, but no biggie I will just make the cookies smaller next time! This was a wonderful baking ptoject for my son and I. Thank you for sharing this recipe! I made two double batches yesterday. Some for the office cookie exchange and some for other gifts, but my family keeps eating them! They are so yummy! My cookies cracked when I put the kisses on and pieces broke off? I was so disappointed. I made these for christmas, i followed the directions 100% and i really did love them! The cookie cracked when i pressed the kiss in but it really didn’t matter to me personally. The recipe is super simple and quick to make, you can taste the salt in it so if that bothers you i’d add a little less. The end result is more like a brownie rather than a cookie so that’s what i called them and they were a hit! They looked fabulous but my family thought they tasted too rich. Any way to keep the chocolate look but take away some of the richness?